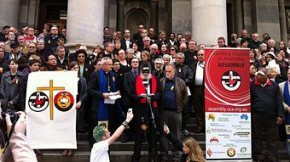 It wasn’t on the schedule, but the thirteenth triennial Assembly of the Uniting Church found itself on the steps of the South Australian Parliament in July. I overheard one minister say, “The last time I stood on the steps of Parliament House I was a student at Adelaide Uni, upset about the Vietnam war … and we weren’t there to pray!” He wasn’t the only member I heard expressing surprise and delight at what he or she had just done. During the lunch break on the fourth day, all the members of the Assembly, many of the guests and some local Uniting Church members (about 400 people in total) walked silently from the Assembly venue to the Parliament House of South Australia to hold a vigil in response to the passing of the federal “Stronger Futures” legislation. The decision arose spontaneously from the Assembly’s discussion of the report from the Uniting Aboriginal and Islander Christian Congress (UAICC), to which all the Aboriginal and Islander members of the Uniting Church belong and which has oversight of ministry by and with the First Peoples. The Assembly decided to walk to Parliament House to sing, pray and mourn the continuing disregard shown to the First Peoples of this land in a public act of worship and lament. The Assembly and the UAICC did not want to deny the seriousness of the problems facing many Aboriginal communities or the importance of some of the new inputs to those communities provided for in the legislation. But it believed the lack of genuine consultation and the imposition of policies that were not developed in partnership with those who would be most affected compromised the legislative package as a whole, making it unlikely to achieve its stated goals. In the process it was experienced as disempowering and humiliating. It wouldn’t have been unusual for an Assembly, hearing such a report, to express its concern in a resolution, say, to write to the relevant federal minister, or to encourage the UAICC and/or another of its agencies such as UnitingJustice or UnitingCare to continue advocacy on the issues. But on this occasion the Assembly chose to get up, walk to a public place and to engage in an act of lament. This decision to make a specifically religious, liturgical response reflected an important change that has taken place in the relationship between the Assembly and the UAICC. I think we’d all assumed the change was essentially technical and symbolic, but it turns out to be more than that. This is thoroughly conventional Christian theology – the kind of thing that is commonly said by evangelical and liberal, conservative and progressive theologians. But it is the first time any Australian church has gone through the long process of taking this thing that theologians have been saying for a long time and embedding it in formal doctrine. For the Uniting Church, most of the things that theologians discuss don’t need to be regarded as official teaching. The essentials are already well accounted for in its foundational theological statement, The Basis of Union. But this needed to be treated differently. It is connected to the material circumstances of the most disadvantaged group in the Australian community – and the most vulnerable people in the Christian community. Of these peoples who have been treated with contempt and disdain the Uniting Church says, the triune God has been with them from the beginning – long before European contact. Who they are and what they know matters deeply – regardless of how inconvenient or uncomfortable that might be to the Second Peoples. The Preamble’s recognition of the theological significance of Aboriginal culture and history is accompanied by another important theological affirmation. At the invitation of the UAICC, in 1994 the Assembly had entered into a solemn Covenant with the Aboriginal and Islander members of the church to work together for justice and reconciliation between the First and Second Peoples in the church and in the nation. The Preamble says: “the Church celebrates this Covenantal relationship as a foretaste of that coming reconciliation and renewal which is the end in view for the whole creation.” This is a big theological claim in the Uniting Church’s perspective. The Uniting Church’s Basis of Union affirms that the mission of God is to bring “reconciliation and renewal.” It is “the end in view for the whole creation.” Moreover, the Uniting Church believes that the church exists solely to be a sign, foretaste and instrument of that “reconciliation and renewal”. Reconciliation is what the Uniting Church is all about. So we must be a church that transgresses and transcends whatever divides our world. That means being passionate about sharing the Gospel, confident that it still has the power to heal and transform broken lives and societies. It means being a multi-generational, multi-ethnic, cross-cultural network of congregations and agencies with genuine relationships with people on the edges of Australian society and with Christian communities in Asia, the Pacific and Africa. It means working harder at enabling the participation and leadership of women in the church. And it means being a church with a passion for and practical commitment to reconciliation between indigenous and non-indigenous Australians. And when any of this feels as though it’s just too hard, it means finding the strength and hope to persevere in the knowledge that this “reconciliation and renewal … for the whole creation” is actually God’s work. Its fulfilment is already pledged in the ascension of the risen crucified Christ and in the gift of the Holy Spirit. Now the Preamble to the Uniting Church’s Constitution identifies the Covenant between the Assembly and the UAICC as a specific instance of everything we stand for. Not just a few concerned people, not just a couple of our sectional interest groups, but the Uniting Church as a whole has come to make this affirmation. The First Peoples are not “them” – they are “us.” Improbably, uncomfortably, but wonderfully we have recognized that we are one body in Christ after all. And “if one member suffers, all suffer together with it” (1 Corinthians 12:26). That’s what the Assembly was doing on the steps of the South Australian Parliament House. The Assembly wasn’t meddling in politics – it was being itself, the church. Andrew Dutney is the President of the National Assembly of the Uniting Church in Australia, and teaches Systematic Theology at Flinders University. This article was first published on the ABC Religion.